Two clever Canon compacts compared. One lost viewfinder. A couple of years ago, Canon’s compact range was awash with cameras that offered an optical viewfinder to supplement the LCD viewing screen, but today there is just one, the small but slightly bulky G12 that straddles the amateur-professional divide. Meanwhile, Canon’s competitors offer equally slender pickings for those who want a viewfinder (thanks, Nikon, for the Coolpix P7000) and some have never offered the feature. I find this strange. Am I the only person in the world who cannot see what’s on the LCD panel when I’m outside in bright or often even medium light? Apparently I’m not, because everyone I ask shrugs and takes it for granted that you can’t use compacts to take photos in sunlight. So what Canon and the others are saying is: “We’re giving you a camera of incredible ability given its size and price, but we don’t really want you to be able to use it on a sunny day.” The beauty of the viewfinder is, of course, that you can see through it 24/7 and even though it might not be 100 per cent accurate, it’s good enough, and certainly way better than pointing in the general direction and hoping for the best. Somewhere in between, a few compacts offer an accessory viewfinder that attaches to the hotshoe, but fitting this significantly increases overall bulk and is usable with accuracy only at the specific focal length for which it was designed. Typically, these are cameras with a wide-angle view of around 24/25mm equivalent, and typically quite expensive. The slip-on viewfinders are always matched to the widest angle of view. I’ve asked various camera companies why they have all but dropped the viewfinder and responses have varied from not knowing to the good old, “there’s no demand”, suggesting their brand of research has shown users don’t go out into the mid-day sun and get the urge to take a photo. It can’t cost the manufacturers much at factory-level to fit a zooming viewfinder, so perhaps it’s because this segment of the market is so hugely price sensitive and, anyway, most punters make their buying decision in a shop where the images on the monitor are bright and clear. So thank heavens for the PowerShot G12, Canon’s last viewfinder camera, although you have to wonder how long it will continue in the face of competition from the most compact of the DSLRs and the Micro Fourth Thirds genre, even though the MFTs use an awful electronic viewfinder. 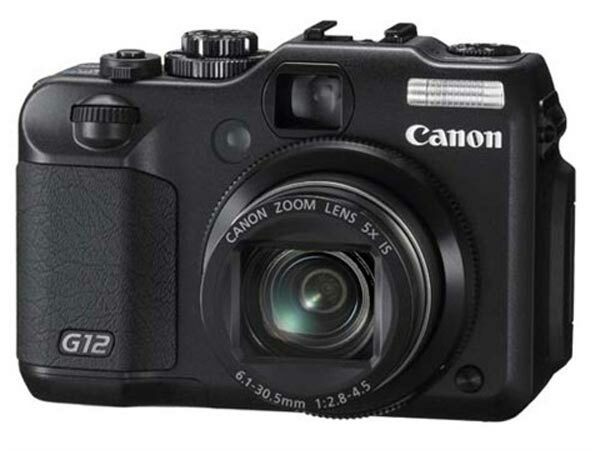 The G12 can trace an ancestry going back more than 10 years – a long time in the rapid comings and goings of digital cameras. It has, particularly since the G7 of 2006, been a widely acclaimed camera. It’s able to shoot RAW and I know several pro photographers who use a G not just as a backup, but also as the primary camera for some jobs, despite its small sensor. With street prices ranging from around $880 to $950 it sure beats spending $9500 for a less versatile Leica M9 rangefinder body! Does Canon shoot self in foot? So with the G-line firmly established, Canon made an interesting decision to slim it down into another version, represented here by the S95, sort of a G12-lite. The S95 has no viewfinder, but has many of the G12’s technical features, including the 1/1.7-inch 10MP CCD. 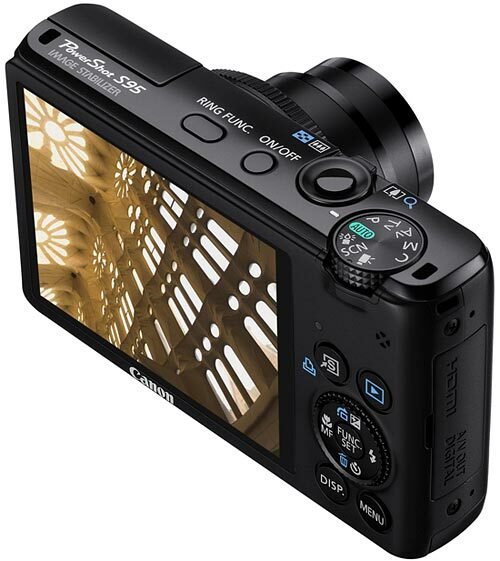 Its street price of around $720 to $800 offers a reasonable saving over the G12 and anecdotally is attracting buyers from the larger camera – presumably those who don’t photograph outside on sunny days. So in opening a new niche, the S95 may be cannibalising its own G12 sales. The G12 came along last year, only a year after the G11 that introduced to the body a flip-out-and-twist 2.8-inch LCD screen, one of the most useful features you can have on a camera. 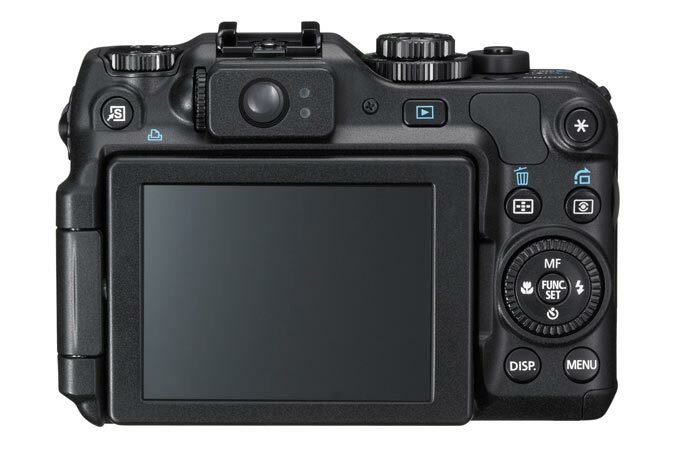 The G12 added a wider range of shooting modes, 720p HD video, and a useful ISO dial calibrates in 1/3-stop increments between ISO 80 and 3200. 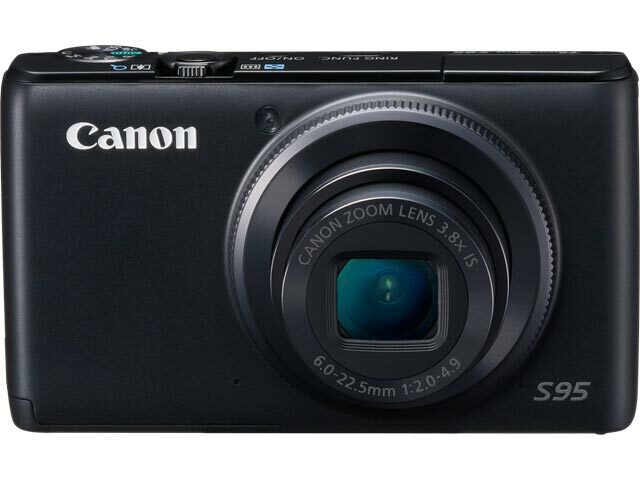 The PowerShot S95 was released last year as the successor to the S90 but with a thinner body, better image stabilisation, 720p HD video with stereo sound, automated HDR shooting, and improved ergonomics. It also features the S90’s control ring around the lens that allows the quick changing of many important settings. The auto HDR quickly shoots three bracketed exposures when the camera’s on a tripod and automatically composites them for better dynamic range and colours. The G12 can also do this, but I found the feature of little practical value on either camera. Might as well just achieve the same result using a cheap post-processing program like Perceptool. More usefully, S95 is the first compact with Hybrid Image Stability that detects both angular and lateral shake and compensates for it. However, for me, a top feature is its good build quality. It feels like it has been laser-cut from a solid block of titanium and works with the precision of a fine instrument. • It doesn’t have the flip/twist almost-every-which-way viewing screen that makes it so easy to do anything from photographing the undersides of my Jeep to framing arm’s length self portraits! • It lacks the viewfinder. • It lacks a hotshoe for accessories such as external flash. The G12 can interface with Canon’s excellent Speedlite flashes. I tried hard to like the S95, and it has a lot more to like than the features already mentioned. Its 28mm-105mm equivalent lens is shorter than the G12’s 28-140mm but image quality is first class, giving nothing away to the larger camera’s lens (see also, Cameras with IQ). It offers an f2 max aperture compared to the G12’s f2.8, providing added versatility in low light. It’s one of the few cameras of its class to offer RAW shooting mode, allowing pro-level post-processing capabilities. The camera is quick and slick to use and my only real complaint is that the pop-up flash is annoyingly located to almost certainly get in the way of the photographer’s left-hand thumb. The S95 is genuinely pocketable, one reason I like a small digital. I always regarded the G12 as too large, or more precisely too thick at 48mm (about double the S95), to be pocketable. However, I’ve found it will indeed fit into the larger pockets of my “outdoorsy” shirts, although its 410g weight causes a fair bit of pocket sag! Nevertheless, it can be done and thus be ready for near-instant use. The G12’s ready to go within about a second of pushing the on/off button and there’s no stumbling over the controls. A stubby dial on the right side sets the mode and, beneath it, a wider dial sets the ISO, or you can just click it to Auto. To the left of the viewfinder, a most useful dial cranks-in up to two stops of under-or over-exposure for those frequent occasions when the exposure meter doesn’t get it quite right. Another significant dial, on the back, sets flash, self-timer, close-up focusing and manual focus. I can’t think of another digital camera that offers significantly easier access to key functions. The S95’s start-up is also quick and fumble-free. But then. The G12’s great shortcoming is that it’s too slow taking action photos, a function for which a viewfinder camera is well suited. But the G12 (and the S95) is like a Ferrari with a Morris 1300 engine. In a variety of action situations, its focus was too slow and I kept getting great photos of where the action had been a second before. Forget sequences, the processing of the image in either RAW or high quality JPEG is just too slow. My old, obsolete, EOS 350D DSLR is like a rattle-gun by comparison. Ditto my new-ish but equally obsolete viewfinder-equipped Leica M8. However, Canon does not claim either the G12 or S95 to be an action camera and most owners won’t want them for that role. But be mindful of this if you think either one would be a cool camera to capture little Johnny scoring his soccer goal. The thing that irks me about this slowness is that the G12 is so darned good at everything else, just as the S95 irks me because it is so good in its class but I can’t use it outside at high noon. I can see why professionals embrace these cameras, not only because it’s a helluva lot more pleasant toting a G12 around than, say, a large and heavy EOS 1DS Mark III DSLR. Despite their small sensor and despite the lenses, which presumably fall somewhat short of Canon’s pro-level L glass on the optical test bench, both display very good image quality overall even, in the case of the S95, at f2. Their images can easily be blown to double-page-spread A4, the largest size many pros are ever going to need to worry about. Not only that, shooting in RAW allows high quality tweaking in such programs as Adobe’s Lightroom to eliminate shortcomings, including modest vignetting and distortion at the widest of the zoom settings. Image not quite contrasty or vibrant enough? Give it a wee tweak in post-processing. But as they come from the camera, even at higher ISO speeds, the G12’s and S95’s frames leave little to be desired. Nice overview! One thing that I would add is ergonomics. I have been a long time user of G series compacts. I tried to love the S95, but couldn’t. The thing is just too darn small to operate with any sense of purpose or effectiveness. I found myself barely able to compose a shot trying to hold it and operate it in manual mode. Very frustrating. I have gone back to the G12 and have no such issues. It is chunky, but just right. I can always ‘feel’ what I am doing and, for me, that is all that matters. I would love to be able to have that f2.0 on the G12 though. Maybe in the G13!